Rebecca Rodriguez, an animal activist and filmmaker featured in Spot in July '09, has an impressive, diverse resume. She also possesses the moniker: Inventor. As Oregon Humane Society’s Animal Care Supervisor in 1992, Rodriguez was charged with putting together an evacuation plan for the animals. “Figuring out what to do with the dogs was easy,” she says. “But when I got to the cats. . . .” Images of having to literally herd cats causes Rodriquez to pause and shake her head. At that time there were 50-100 cats in the shelter. She knew getting crates out of storage and assembling them would be time consuming; she wanted to know how much time. So she tested it. Describing the scene Rodriguez says, “It was like a cartoon.” The cats, being cats, did everything in their power to stay out of the crates. It was clear that crates would simply not make for a speedy evacuation. “For two weeks straight I wasn’s sleeping,” Rodriguez recalls. Then, a light bulb: pillowcases. “Well, not pillowcases,” she explains, because “Pillowcases are for pillows.” But something like that — easy to store and use, while breathable and safe — would be perfect. After some research and experimentation Rodriguez had her first version of the Evacsak. 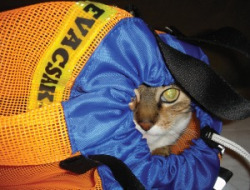 Made from bright nylon mesh that’s safe and breathable, the Evacsak is not intended for long-term housing, but for tranporting a small pet quickly and safely, it’s, well, perfect. Terri Crisp, author of Out of Harm’s Way, put the Evacsak to work in 1993 during the catastrophic flooding in Missouri. After use in the field, Rodriguez added safety features like a reflective shoulder strap and piping, and an ID tag (which Rodriguez recommends be filled out in advance). Check it out at www.EvacSak.net. To make your safety kit even more affordable, Rodriguez is offering a 15% discount to Spot Readers. Look for the “I saw it in Spot” button on the Order Now page. A 40% discount is always available to nonprofit rescues. This is one part of our 2009 Disaster Preparedness series. Click here for additional coverage. Posted in Safety, Product Review, Animal Welfare and tagged with Disaster Preparedness, Safety, Cats. November 1, 2009 by Jake Faris - Spot Magazine.